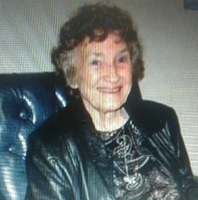 Provide comfort for the family of Faye Swales with a meaningful gesture of sympathy. Mrs. Faye Harrell Swales, age 87, passed away Wednesday March 27, 2019 at St. Dominic Jackson Memorial Hospital in Jackson, MS. Visitation will be held Monday, April 1, 2019 from 1:00PM until 1:50PM at Rehobeth Baptist Church in Pelahatchie, MS. Funeral services will be held at 2:00PM with Bro. T.J. Bates and Bro. Rick Hammerstrom officiating. Burial will follow in the Rehobeth Baptist Cemetery, in Pelahatchie, MS. Wolf Funeral Services in Morton, MS is in charge of arrangements. Mrs. Swales was a resident of Jackson, MS for over 50 years. She had resided in Pelahatchie, MS for the past 10 years. She was Baptist in faith, and a member of the Rehobeth Baptist Church, in Pelahatchie, MS. She was a member of the church choir for several years. She served as a child care provider at Alta Woods Baptist Church for a number of years. She was preceded in death by her parents, Troy and Eula Bell Harrell; her sister, Bernice H. Bludnick; her niece, Judy Penn Biggs. She is survived by one daughter, Cheryl Crawford (Alan) of Pelahatchie, MS; one brother, James Harrell (Diane) of Pelahatchie, MS; four grandchildren, Spencer Crawford (Katie), Amber Crawford McCallum (Ryan), Quin Crawford (Laura), and Jade Crawford; 2 great grandchildren, Hunter and Paul Alan McCallum. To send flowers in memory of Faye Swales (Harrell), please visit our Heartfelt Sympathies Store. Provide comfort for the family of Faye Swales (Harrell) by sending flowers. We were so sorry to hear about the passing of Faye. She was a nice lady and will be missed by all. May God bless the family at this difficult time. My condolences to each of you and your family. Imagine living in a world free of sickness, suffering and death. It is possible, for the Bible assures us of such a world and we can trust in Jehovah God’s word for he is able to fulfill whatever he promises. (Isaiah 33:24, 55:11 and Revelation 21:3, 4). May the family of Faye Swales please accept my sincere condolences hoping you find comfort in God's words at Acts 24:15 and Psalm 37:29.